Today I received my advance copy of Leonard Maltin’s 2015 Movie Guide, and I’ve been paging through it with profoundly mixed emotions. Once again, I am unreasonably proud of my humble contributions to the enterprise. (Leonard asked me to come on board as a member of Team Maltin during preparations for the 2009 edition – an honor I rank alongside Peter Bart’s invitation to be a Variety contributor back in 1990.) At the same time, however, I am unspeakably sad, because this is the end of the line: The 2015 Movie Guide will be the last. Originally known as TV Movies, Leonard’s invaluable paperback resource first appeared in 1969, and has been published annually since 1988. Long, long before I was a contributor, I was a faithful fan, dutifully purchasing each new edition – and always keeping a copy close at hand. No kidding: For decades, to paraphrase the old tagline for American Express Travelers Cheques, I didn’t leave home without it. And when it wasn’t in my suitcase during my travels for movie junkets and film festivals, you could always find it on a short shelf of absolutely essential reference books, either by my desk at The Houston Post or in my home office. Unfortunately, as Leonard notes in the latest (and last) edition’s forward, “With ready access to information on the Internet, our readership has diminished at an alarming rate. “The book’s loyal followers know that we strive to offer something one can’t easily find online: curated information that is accurate and user-friendly, along with our own reviews and ratings. By the way: I can't help noting that Leonard is only two years older than me. Meaning that when he and I were both college boys, he had the savvy and resourcefulness to kick off his Movie Guide franchise, while I was still scrounging for movie passes so I could write reviews for my campus paper. Well, it's nice to see that youthful hustling paid off for one of us. My daughter, a Classics Professor, shared this blog with me. She was born the year his book was. "The new Maltin" was an annual event in our home. I taught film and marveled at how those micro reviews always hit the salient points. Maltin proved Polonius' point. Brevity is the soul of wit, at least in wise hands. No! I love buying them every year. And I was looking forward to the next edition of the Classic Movie Guide as well. This is a sad sad day for me! Glad to know you're still active in the film critique business. I miss the contributions Eric Gerber and you made to Houston's then-nascent-but-now-stillborn film critics group. Now the Houston Chronicle slowly withers on the vine, content to pinch reviews from other Hearst newspapers. Sad too to see the end of Maltin's Guide. It was ...and is...an admirable but neverending publication constantly in need of as much attention as a newborn. Jeff Millar, Eric Gerber, you and Matlin are are all not only giants but also greatly missed. This is heartbreaking. Maltin's annual guide is essential. I'm sorry the content won't be transferred to a website, behind a paywall, for I'd gladly pay a fee to access it. Yesterday the phone company pulled out the phone booth across the street and now this. The 2001 edition is at my feet this very moment and more recent ones are a few seconds away on the shelf. It is SO much faster to just reach for "Maltin" than to do a web search AND it keeps the brain familiar with the concept of alphabetical order. Turning pages is nice. Not having ads blink at you is nice, too. The Internet is a fabulous resource but a Maltin guide is pithy, accurate and endlessly useful. Mr. Leydon, as a belated fan of the legendary Guide and a longtime admirer of your writing, I'd like to put a question to you. Which editions of the Guide do you consider landmarks? Which one, for instance, was the last to feature made-for-TV movie ratings (below average, average, above average) before the publishers dropped them? You already mentioned that the 1988 edition kicked off the annual tradition that has continued to the present. Are there any others of note? Thanks for your contributions to this great institution! 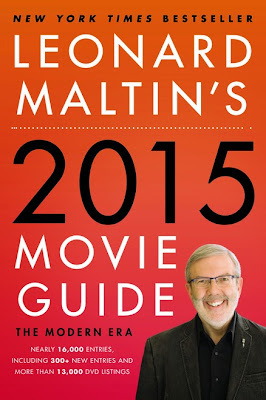 I have bought Leonard Maltin's Movie Guide since the early 1980s and have always enjoyed it. He has over 16,000 thoughtful reviews of many different movies.